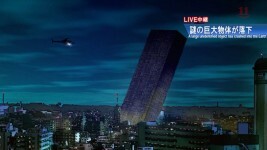 Last episode, the large brick heading towards Earth finally landed, bringing chaos and fear along with it. 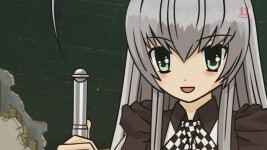 This week’s episode begins by Mahiro watching the news cast showing the large brick before Nyaruko grabs his attention. 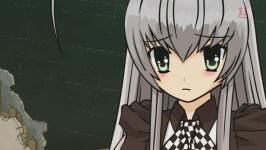 She says that she needs to get going because everyone is waiting for her. Mahiro asks if this is the big fight that Atoko mentioned earlier and she says yes. Nyaruko then tells him that when she gets back, they’ll do lots of “happy-fun-time” things together (Mahiro tells her not to spoil the ending for the viewers). 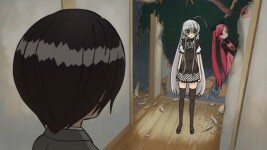 Nyaruko then informs Mahiro that everything will be okay and that they’ll be sure to erase everyone’s memory; she pulls out a brain neutralizer (just like the ones they used in the movie Men In Black) Cthuko then pokes her head in, saying she’s heading to the front lines with everyone else and will meet Nyaruko there. 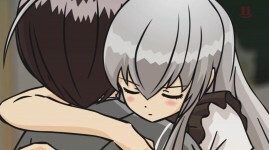 Nyaruko then hugs Mahiro, saying that she’ll be back soon and asks him to wait for her. Just before leaving, she tells him that she’s in love with him.